For dairy farmers, sustainability means making decisions today by considering how those choices will serve the animals, the environment, and their family and community well into the future. California dairy farmers have been advancing their use of technology for more than 200 years. Despite current economic challenges, they continue to invest in technology, as they plan to sustain their operations for generations to come. In the past eight months, the Postma family of Stanislaus County and the Jones family of Merced County have put robots to work on their farms. 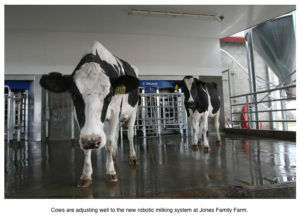 The fully-robotic milking systems are ready to work 24-7, as soon as the cows step in. The robots recognize each cow and provide them with a little grain (a tasty snack) before beginning the milking process, which includes pre- and post-milking udder care. The key difference between these new systems and other advanced milking parlors found throughout the state is that the cows choose when and how often they would like to be milked. The Jones and Postma dairies had been milking two times per day prior to the transition. Now, cows choose to visit the robots two to four times per day. Systems like these are already more prevalent in other dairy regions throughout the United States and Europe, where generally smaller herd sizes mean fewer robots and a lower start-up cost. But, the Postmas and the Joneses decided to explore the idea of bringing robots to the West Coast. On dairy farms like theirs, business decisions involve the whole family. Jonathon Postma, his brother Jack, and their father Pete are partners. Their farm’s history dates back to 1953 when Pete’s parents—immigrants from the Netherlands—were able to start their own herd of 30 cows. The Jones family got their start in the dairy business in 1993, when they followed their passion and converted turkey barns to dairy barns. Their dairy is a partnership between David Jones, his sister Kristen, their parents Rick and Julie, and their grandmother Gerri. When it came time to update the milking parlors, both families considered the California industry norm but were intrigued by the idea of robots. They had to see them in action, so they visited dairies throughout the United States and Canada. A major deciding factor for both families was seeing how calm and content the cows were on the robotic dairies and learning how these systems could benefit cow health. Dairy cows are known as “creatures of habit,” so giving them the option to set their own milking schedule and providing them with a perfectly consistent procedure each time is a dairy cows’ dream. “Cows love it,” says Jonathon. Having more time to focus on the cows was also a key consideration. Milking can be the most labor-intensive job on the dairy, and the repetitive motions and early- and late-hour shifts can make it difficult to find and retain employees. While the robots do replace some jobs, they also improve working conditions for remaining employees and provide more skilled-labor opportunities. Bottom line, they make it easier for farmers to balance human resources with cow care. Jonathon thought making more time for the cows might help sustain the farm for a fourth generation. His children are ages eight, six, and three. 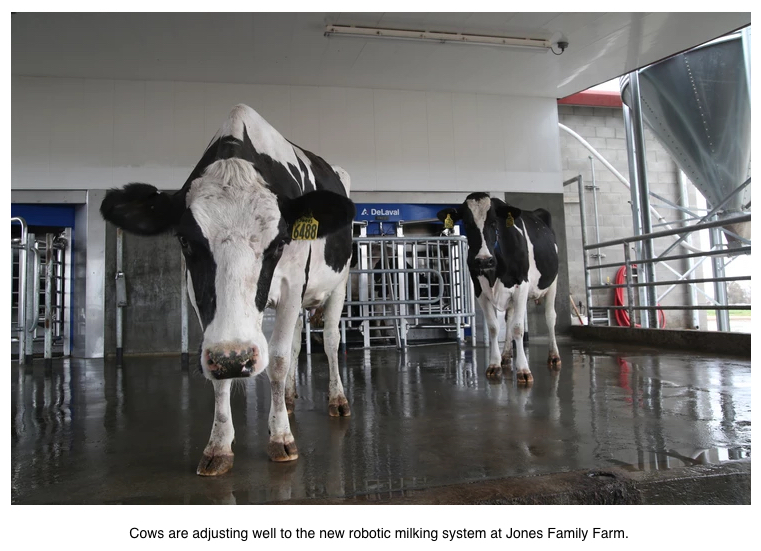 The Postma and Jones dairies certainly are set up for the future, with robots milking at least a portion of their herds and even more robots to be phased in down the road. Cows have adjusted well to their new routines. If there is anything out-of-character about a cow’s activity level or milk production, the robots will send an alert directly to the farmers’ smartphones. “The robots have me on speed dial,” jokes David. Robots are fitting in well on the farms. The Joneses are calling their first two robots Fred and Ethel, names from the family tree. In this way, technology is helping carry on family traditions in more ways than one. California’s dairy families remain committed to investing in their cows, their heritage, and their overall sustainability.